Bordering the Everglades, Parkland residents are no strangers to wildlife. However, when outdoor critters like rodents decide to come inside, it can cause serious problems for home and business owners. Destructive, small-sized mammals that include rats, mice, and squirrels, rodents can gnaw through almost anything with their large front teeth. Prevent costly damage to your home by contacting the professional rodent removal experts at Critter Control® Ft. Lauderdale. Critter Control® Ft. Lauderdale practices a four-step process to remove rodents from your property in a safe and efficient manner. Inspection - During your free consultation, one of our expert technicians will visit your home to identify your pest and determine the severity of your infestation. Removal - We then strategize ways to eliminate your infestation using our humane CritterSafe removal methods. Restoration - We work to repair all the damage caused by your rodent infestation. This includes replacing drywall and insulation and cleaning any droppings the rodents left behind. Exclusion - Finally, we seal off all entry and exit points to ensure rodents and other pest stay out of your home for good. With over three decades of experience, you can trust the experts at Critter Control® Ft. Lauderdale to get the rodents out of your home. 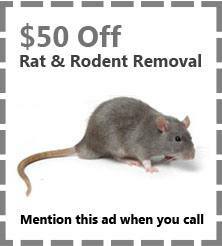 Call us today at 954-467-6067 to schedule your free consultation and save $50 off our rodent removal services. If you’ve been awoken by the alarming sounds of scurrying feet and scratching claws coming from inside your walls or ceiling, you could have a squirrel infestation. The fuzzy critters often like to nest, store food, and find warmth in the attics of residential homes. Although squirrels are more socially accepted over rates and mice, they can be just as destructive as their rodent cousins. If you notice any of the following signs of a squirrel infestation, contact professional squirrel removal experts immediately. You hear strange squeaky, scuttling noises across the floor of your attic or inside your walls. You see a large gathering or a scurry of squirrels outside your home. You smell a foul, ammonia-like odor inside your home. You spot chew holes outside near the roof, or inside on wires, walls, or wooden surfaces. You notice small rodent droppings in or around your attic. Inspection - a consultation from our professional squirrel removal expert is the best way to definitively know if you have squirrels in your home. Removal - we use CritterSafe methods to humanely remove the squirrels from your home. Exclusion - we seal any holes or access points the squirrels used to gain entry into your home. Restoration - we clean and repair the hazardous mess and damage caused by the squirrels. At Critter Control® Ft. Lauderdale, we are highly experienced in squirrel removal. Call us today at 954-467-6067 to schedule an appointment and deal with your infestation before it gets out of hand. Rats are a type of rodent that can grow up to nine inches long with extended, constantly-growing front teeth. A common nuisance to homes and businesses, rats have been known to chew on wiring, insulation, and drywall resulting in extensive and costly damage. Here are some factors that may contribute to a rat infestation and ways you can solve it. Unlike mice, rats are larger, more cautious creatures that know how to avoid traps. Although extermination is sometimes necessary, our CritterSafe program provides humane, non-lethal measures to remove rats from your property. If you suspect you have a rat problem, your best course of action is to call a professional. At Critter Control® Ft. Lauderdale, we offer fast and permanent rat removal solutions. Call us today at 954-467-6067 to schedule your consultation. Mice are nocturnal mammals that can reproduce at an alarming rate. In fact, a single mouse can bear nearly 2000 offspring in one year! For this reason alone, it is important to act swiftly the moment you notice signs of a mouse infestation — because the longer they remain in your home, the more difficult it will be to eradicate them. Here are some warning signs that could point to a growing mouse infestation in your home and ways they can be removed. Be aware of these indicators of a potential mouse problem. Noise - Mice are active at night. If you are awoken by scurrying and scratching sounds coming from your walls or attic. Nests - Mice build nests for their litters in soft places like boxes and attic insulation. Smell – Mouse droppings can cause a foul, repugnant odor throughout your home. Droppings - Piles of mouse feces are usually found around attic openings. Gnawing - Mice like to sharpen their ever-growing teeth by chewing through drywall, wiring, pipes, wood, and cardboard. They can also gnaw into food containers in your kitchen pantry. Having mice in your home can put you and your family in harm’s way as mice have been known to transmit diseases like hantavirus and leptospirosis. Many homeowners are tempted to try poisoning the mice, but this treatment option should be avoided as it can be hazardous to pets and children. At Critter Control® Ft. Lauderdale, our technicians use cutting-edge tools and training to rid your home of unwanted mice. Our removal solutions are effective and permanent, and our technicians will repair any damage the mice may have caused. Don’t let a few mice grow into a full infestation, contact the professionals at Critter Control® Ft. Lauderdale for quick and efficient mice removal. Call us today at 954-467-6067 for your fast, free estimate.